PHOENIX — In a warehouse in north Phoenix on Saturday morning, a woman sat on the floor among piles of toothbrushes, toilet paper and soap. She packed a cardboard box full of diapers then taped it shut. A man picked up the box and set it against the wall. The woman started fresh with a new box, carefully packing newborn diapers. 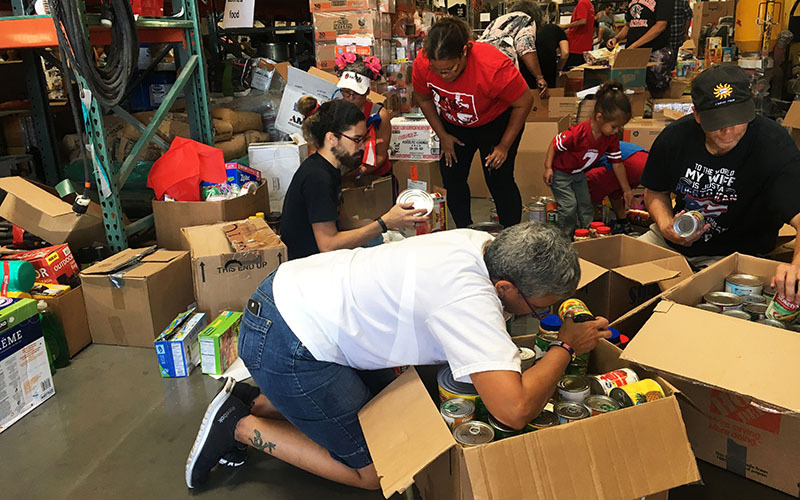 Community members worked through the day as part of relief efforts after Hurricane Maria, a Category 5 storm, devastated the island of Puerto Rico on Sept. 20. The warehouse was the headquarters for donations to be dropped off, sorted and packed into trucks. Volunteers will drive the trucks to Florida and the supplies will then be flown to Puerto Rico. Many of the volunteers had family in Puerto Rico. Some were still waiting to hear if their childhood homes were still standing. One woman said her brother was dying in the hospital because he didn’t have access to the medicine he needed. Zulema Rodriguez, one of the organizers of the donation drive, didn’t know if her aunts, uncles and cousins were alive. And that wasn’t her only worry. Rodriguez said the event started as a few people in the Puerto Rican community in Phoenix wanting to help their island. From there, it grew. The warehouse space was donated, as were the supplies, the trucks and the volunteers’ time. The motivation was simple. “Our families need to know that we worked hard for them,” Rodriguez said. Puerto Rican music played through the day. Volunteers kept unpacking supplies, labeled them and repacked them. Children helped, stacking supplies in neat piles. Around noon, pizza was delivered. A group of doctors had heard about the event and bought the lunch for the volunteers. 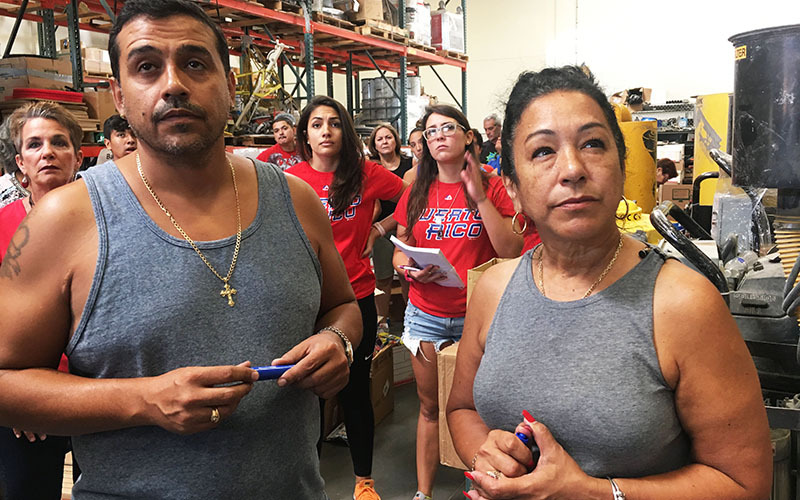 Lillian Ortiz, a Valley local of Puerto Rican descent, was walking through the warehouse when her friend spotted her. Her friend jumped and screamed and laughed, hugging Ortiz and kissing her cheeks. Ortiz was in Puerto Rico on vacation with her boyfriend when the hurricane hit. Now, she was back in the Valley safely and lending a hand to those still on the island. When the hurricane hit, Ortiz and her boyfriend Pedro Espinoza Jr. were in their hotel. They gathered in a large room with the other guests, who brought pillows and blankets. The Wi-Fi and telephone networks were spotty and worked only intermittently. Ortiz said the power was out at the hotel. She wasn’t able to use a debit or credit card and was left with only the cash she had on hand. When the Wi-Fi was working, Ortiz posted a quick Facebook status to tell her family that she was safe. She didn’t know what was happening outside the walls of the hotel. She didn’t know if her hometown had been leveled or was still standing. She received messages from Puerto Rican friends in the United States, asking about their own family members. Eventually, Ortiz was able to visit her hometown in Puerto Rico, which isn’t far from the hotel she was staying in. She checked on her family. Thankfully, she said, everyone was okay. Friends in the United States asked her to check on their families. She was able to make contact with some of them. She took videos of herself with her friends’ families and sent them back to the States. She felt lucky to give her friends some relief. She understood that not knowing was the worst part. Democratic U.S. Rep. Raul Grijalva of Tucson stopped by the volunteer event. He walked slowly through the warehouse, shaking hands and patting people on their backs. Volunteers stopped what they were doing to greet him. Grijalva noted the differences between relief efforts after Hurricane Irma in Florida and Hurricane Harvey in Texas. “In other words, treat the people of Puerto Rico and its 3.4 million American citizens the same way we treated the people in Texas and the same way we treated the people in Florida,” he said. As noon faded into the early afternoon, a young woman stood on a stack of water bottle cases. A young man stood next to her. They yelled for the volunteers’ attention. They congratulated them on a job well done. They sang traditional Puerto Rican songs. They clapped. They smiled. They chanted. Ortiz wasn’t surprised by the spirit of the volunteers even in the face of grief, uncertainty and disaster.